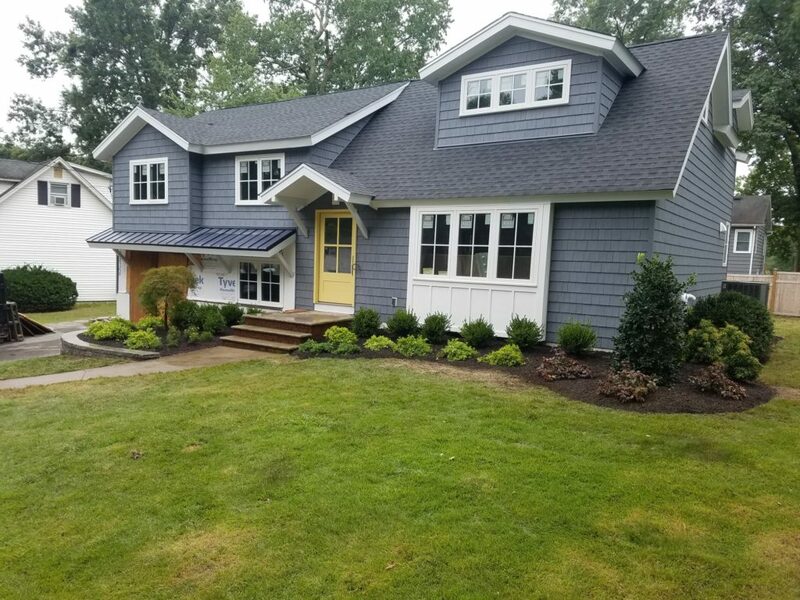 we can help with all your landscaping near Morristown Nj, New Vernon, Harding, Mendham, Randolph or other neighboring towns. 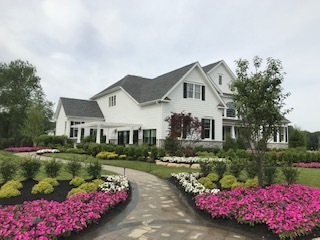 We have been landscapers for the Morristown area for 30+ years with experience in planning and implementing landscaping projects like the ones mentioned below but if it is outdoors most likely we can do it or know someone local who can help with all your landscaping near Morristown Nj. They do what they say they’re going to do, when they said they would do it, and then some! Anthony is a pleasant person who is very knowledgeable in his field. Equally important, he is a straight shooter and follows through on his commitments. We use Anthony for our landscaping Projects and snowplowing needs. Our property requires some special attention due to its contour. In the past, this necessitated constant reminders. With Anthony we were able to explain once and the job was done correctly every time after that. The snowplowing team is simply amazing! Our driveway requires a skilled driver and we couldn’t be more pleased with the outcome. Bottom line, if you want a professional team that is reasonably priced and client driven, I strongly suggest you get in touch with Anthony. Everyone knows that you don’t want to place a water plant in a desert garden. That’s a recipe for plant-icide. But the same is true for many other types of plants — many prairie plants won’t thrive in waterlogged soil, and many rock garden plants keel over if they’re tucked into rich, loamy garden beds. How do you know if a plant will thrive in your landscape? It all boils down to right plant, right place. This modern gardening philosophy plays matchmaker in the landscape, placing plants in a spot where they’ll naturally thrive — with minimal input from the gardener. The result is a landscape design that’s a breeze to maintain. Plants withstand attack by insects and diseases. Plants in the wrong place have a compromised immune system, if you will, and when a bug comes, they’re ripe for the infecting. The biggest investment you’ll make when you tackle right plant, right place gardening occurs before you stick trowel into soil. Planning is the key to success with this concept. By investing more time before planting, you’ll invest less time maintaining plantings. You’ll be gardening smarter and greener — and saving money, too. The USDA Hardiness Zone reveals if plants will survive winters in your region. Many gardeners push the envelope on hardiness zone and grow plants from one zone warmer. They tuck these questionable survivors into a sheltered backyard or maybe in a planting bed near a southern wall of their home, where temperatures don’t fall quite as far in winter. For sure success, though, fill a landscape design using plants that are hardy to your zone. Not sure what your zone is? Learn here. Some plants need full sun to thrive; others require shade. You’ll get the best gardening results when you know what kind of light your yard offers. To figure this out, on a day when you’re home, watch the sun as it hits your landscape areas. Ideally, check it every hour — and make notes. That way, when a plant tag says “partial shade,” you’ll know if your yard serves those conditions. Pictured below: Light makes all the difference in a plant’s success. Traditional bleeding-heart, Dicentra spectabilis, grows best in part to full shade. Plants need specific soil types to grow their best. The great thing about soil is that you can change it by adding amendments. For instance, you can make clay soil, which is slow-draining, more porous and faster-draining by adding organic matter, like compost. Or you can create a completely different soil type in your landscape by building and filling raised beds, which also add some nifty hardscaping to the scene. When you place the wrong plant in the wrong kind of soil, you’ll get mixed results. Worst-case scenario, the plant dies. Best case, it survives, but with lackluster results. Each soil type accommodates a different palette of plants. Before you embark on creating wholesale change in soil, research the kinds of plants that grow in the soil you have. You might find you can design an eye-catching landscape. Pictured below: Butterfly weed, Asclepias tuberosa (left), is a native wildflower that’s a favorite among bees and butterflies. It grows well in either dry, rocky soil or soils with medium moisture. Red hot poker, Kniphofia uvaria (right), demands well-drained soil. This plant is growing on heavy clay soil that doesn’t drain — and isn’t doing well. Plant tags state how large plants grow under ideal circumstances. Plan for this contingency and site plants accordingly, giving them ample elbow room for spreading and plenty of headspace for upward mobility. In the right place, tall plants can form a privacy screen or stage a striking backdrop for other plantings. In the wrong place, they’re an eyesore. Conversely, plants that are too small can be dwarfed by surrounding plantings or hardscaping and disappear from view. Pictured below: Choose plants carefully for edging walking paths. A short, fountainous grass like blue fescue, Festuca glauca (left), is just right for edging a path without becoming a tripping hazard or blocking the view. A mature hollyhock, Alcea rosea(right), grows too tall for placing at the front of a flower bed. Its imposing stature dwarfs shorter front-of-the-border plantings. As you select plants, consider leaf and flower color, and how it will blend or clash with existing landscape and hardscaping. An easy way to succeed with color is to design with hues from the same color family. This works especially well in front yard gardens, where you want to make a great first impression on guests and passersby. Another goof-proof method is scattering clumps of the same color throughout planting areas, creating what’s called a color echo. Don’t forget to study bloom time and plan for color throughout the gardening season. Add in contrasting leaf and plant textures to stir some drama in the landscape. Pictured below: Create an eye-pleasing planting by using a color echo in plants and hardscaping. Here, burgundy repeats in barberry shrubs and a back door. Most gardeners grapple with some kind of critter issue. Whether it’s tunneling voles, hopping rabbits or strolling deer, wildlife can make short work of any landscape design, transforming gardening efforts into stems and stubs. While you may not be able to win every battle, you can outsmart the animals. Installing hardscaping, like a fence, provides a physical barrier that can limit wildlife’s access to gardening areas. But in formal front yards or excessively large backyards, a fence isn’t always practical or affordable. You can also outwit critters by choosing plants they dislike. If rabbits devour your coralbells (even though they’re not supposed to eat those), ditch the coralbells for something local bunnies find less palatable. In the long run, you’ll save yourself hours of aggravation and likely a wad of cash that you would have spent on replacement plants. Pictured below: Give deer the brushoff by using plants they find distasteful, like cheery daffodils and variegated ‘Jack Frost’ Brunnera, B. macrophylla. Pruning changes the form and growth of a plant. Pruning can also be considered preventive maintenance for both insect and disease damage. Many problems may be prevented by pruning correctly during the formative years for a tree or shrub. The late dormant season is the best time for most pruning. To encourage flower and fruit development. To maintain a dense hedge. To maintain or encourage a desired plant form or special garden forms. Appearance in the landscape is essential to a plant’s usefulness. For most landscapes, a plant’s natural form is best. Avoid shearing shrubs into tight geometrical forms unless they need to be confined or trained for a specific purpose. When plants are properly pruned, it’s hard to tell that they’ve been pruned. Control plant size and shape. Keep shrubby evergreens well-proportioned and dense. Remove unwanted branches, waterspouts, suckers and undesirable fruiting structures that detract from plant appearance. Have hazardous trees taken down. Prune out weak or narrow-angled tree branches that overhang homes, parking areas, sidewalks and anyplace falling limbs could injure people or damage property. Eliminate branches that interfere with street lights, traffic signals and overhead wires. DO NOT attempt to prune near electrical and utility wires. Contact utility companies or city maintenance workers to handle it. Prune branches that obscure vision at intersections. For security purposes, prune shrubs or tree branches that obscure the entry to your home. Pruning is really the best preventive maintenance for young plants. It is critical for young trees to be trained to encourage them to develop a strong structure. Young trees pruned improperly or not pruned at all for several years may require heavy heavy pruning to remove bigger branches to prevent trees from becoming deformed. At planting, remove only diseased, dead or broken branches. Begin training a plant during the dormant season following planting. When planting deciduous shrubs, thin out branches for good spacing and prune out any broken, diseased or crossing or circling roots. Remove diseased, broken or dead branches. If two limbs are crossed, entangled or otherwise competing, remove one of them completely at its base. Remove any limbs along the trunk that are bigger in diameter than the trunk. Remove suckers coming up from the roots or low on the trunk. Remove vigorous vertical branches, called watersprouts. Make pruning cuts close to the branch collar at the base of the limb. For larger limbs, start the cut from the underside of the limb to avoid tearing the bark. Remove large limbs first, starting with the top of the tree. “Thinning” cuts remove entire branches at the branch collar and are usually the recommended type of cut. “Heading” cuts remove only part of a branch and encourage vegetation growth below the cut and are not as common. Leave the pruning of large trees to qualified tree care professionals who have the proper equipment. Consider the natural form of large trees whenever possible. Most hardwood trees have rounded crowns that lack a strong leader and may have many lateral branches. Crown cleaning – the selective removal of dead, dying and diseased wood from the crown. To remove large branches, three or four cuts will be necessary to avoid tearing the bark. Make the first cut on the underside of the branch about 18 inches from the trunk. Undercut one-third to one-half way through the branch. Before making the final cut severing a branch from the main stem, identify the branch collar. The branch collar grows from the stem tissue around the base of the branch. Make pruning cuts so that only branch tissue (wood on the branch side of the collar) is removed. Be careful to prune just beyond the branch collar, but DON’T leave a stub. If the branch collar is left intact after pruning, the wound will seal more effectively and stem tissue probably will not decay. Pruning in late winter, just before spring growth starts, leaves fresh wounds exposed for only a short length of time before new growth begins the wound sealing process. Another advantage of dormant pruning is that it’s easier to make pruning decisions without leaves obscuring plant branch structure. To avoid oak wilt disease DO NOT prune oaks from April to October. If oaks are wounded or must be pruned during these months, apply wound dressing or latex paint to mask the odor of freshly cut wood so the beetles that spread oak wilt will not be attracted to the trees. To avoid stem cankers, prune honeylocusts when they are still dormant in late winter. If they must be pruned in summer, avoid rainy or humid weather conditions. Prune apple trees, including flowering crabapples, mountain ash, hawthorns and shrub cotoneasters in late winter (February-early April). Spring or summer pruning increases chances for infection and spread of the bacterial disease fireblight. Autumn or early winter pruning is more likely to result in drying and die-back at pruning sites. 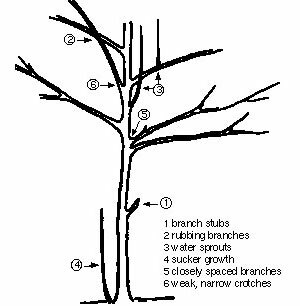 Some trees have free-flowing sap that “bleeds” after late winter or early spring pruning. Though this bleeding causes little harm, it may still be a source of concern. To prevent bleeding, prune the following trees after their leaves are fully expanded in late spring or early summer. Shrubs that bloom on new growth may be pruned in spring before growth begins. Plants with marginally hardy stems such as clematis and shrub roses should be pruned back to live wood. Hardier shrubs such as late blooming spireas and smooth (snowball) hydrangeas should be pruned to the first pair of buds above the ground. After the initial pruning at planting, hedges need to be pruned often. Once the hedge reaches the desired height, prune new growth back whenever it grows another 6 to 8 inches. Prune to within 2 inches of the last pruning. Hedges may be pruned twice a year, in spring and again in mid-summer, to keep them dense and attractive. Prune hedges so they’re wider at the base than at the top, to allow all parts to receive sunlight and prevent legginess. Every year remove up to one-third of the oldest, thickest stems or trunks, taking them right down to the ground. This will encourage the growth of new stems from the roots. Once there are no longer any thick, overgrown trunks left, switch to standard pruning as needed. Deciduous shrubs that have multiple stems (cane-growth habit), and that have become very overgrown or neglected can be rejuvenated by cutting all canes back as close to the ground as possible in early spring. That season’s flowers may be sacrificed but the benefits from bringing the plants back to their normal size and shape outweigh this temporary collateral damage. Spruces, firs and douglas-firs don’t grow continuously, but can be pruned any time because they have lateral (side) buds that will sprout if the terminal (tip) buds are removed. It’s probably best to prune them in late winter, before growth begins. Some spring pruning, however, is not harmful. Pines only put on a single flush of tip growth each spring and then stop growing. Prune before these new needles become mature. Pines do not have lateral buds, so removing terminal buds will take away new growing points for that branch. Eventually, this will leave dead stubs. Pines seldom need pruning, but if you want to promote more dense growth, remove up to two-thirds of the length of newly expanded candles. Don’t prune further back than the current year’s growth. Arborvitae, junipers, yews, and hemlocks grow continuously throughout the growing season. They can be pruned any time through the middle of summer. Even though these plants will tolerate heavy shearing, their natural form is usually most desirable, so prune only to correct growth defects. A good pair of pruning shears is probably one of the most important tools. Cuts up to 3/4 inches in diameter may be made with them. Lopping shears are similar to pruning shears, but their long handles provide greater leverage needed to cut branches up to 1 1/2 inches in diameter. Hedge shears are meant only for pruning hedges, nothing else. They usually cut succulent or small stems best. Pole saws allow for extended reach with a long handle, but they must be used carefully as it is difficult to achieve clean cuts with them. Instantly renew your lawn by laying sod. We’ll show you how. Whether a sparse, weedy lawn needs renewing or you’re facing a barren backyard, laying sod is the easy way to an instant, lush lawn. Costs vary, but in general, expect to pay at least 40 cents a square foot for sod you install yourself. That comes out to $400 for a 1,000-square-foot lawn area. Lay sod in spring where cool-season grasses rule and any time of year where warm-season turf is king. Measure the area you’ll be sodding. Take careful measurements so that you don’t pay for more sod than you need. Order roughly 5 percent extra (over the measured area), so you’ll have enough sod to cut and fit around curves. Purchase sod through a garden center or directly from a sod farm, if there’s one near you. The supplier you purchase from should ask detailed questions about your lawn, including hardiness zone, sunlight vs. shade, how intensely you’ll use the grass and other specifics. These answers determine the types of grasses that will be in your sod. Make sure sod is delivered within 24 hours of being cut. Plan to lay it the day it’s delivered. Use a rototiller to loosen soil to a depth of 6 to 8 inches. Remove any debris you unearth, including rocks. Add and till in 2 to 3 inches of organic matter. Organic matter helps improve soil aeration and water retention and enhances the microbial population in your soil. The bottom line is that organic matter makes your soil healthier. Till in fertilizer or lime based on the results of your soil test. Rake soil level, and ensure that it’s one inch below the grade of sprinkler heads or paved areas, like sidewalks, patios or driveways. Raking evens out the surface and also creates loose soil particles, which are ideal for grass roots to sink into. Soil needs to be moist when you lay sod. Water it well 24 to 48 hours before installation. Water your newly installed sod thoroughly, and continue to water daily unless rain arrives. Water shouldn’t puddle on your new sod. If it does, reduce the time you’re watering. After the first week, reduce watering to every other day. Tapering off on watering encourages grass roots to sink deeper into soil. A deeply-rooted lawn is one of the secrets to growing a lush, healthy, thick stand of grass. By the third week, water only twice, and starting with the fourth week, aim to give grass roughly one inch of water per week through irrigation or rainfall. Time your first mowing when grass is roughly three inches tall and at least 10 days have passed since you laid the sod. Use a walk-behind mower instead of a heavier riding mower, and install a grass catcher to bag the clippings. At this point, the lawn is too immature to let clippings lie. Add your clippings to the compost pile, or use them as mulch around shrubs or vegetables. Make sure the mower blade is sharp, or you’ll risk tearing up newly-rooted grass. Apply a starter fertilizer to grass after about four weeks’ growth. Continue to avoid heavy activity on your new lawn for the first four weeks following installation. After that, enjoy your new toe-tickling lawn. Product costs, availability and item numbers may vary online or by market. Never place the outlet where it will simply move the drainage problem to a different area (especially someone else’s property). Contact your local authorities if you plan to connect your drain to any municipal, county or state drainage or run off system. Contact your local authorities if you plan to connect your drain to any creek, stream or other body of water. Before beginning any excavation, call 811 to check for underground utilities. Locate the basin at the lowest point in the area to be drained. Locate the outlet in an area that will be able to handle the added water. The outlet should be at least 1 1/8 inch lower than the basin for every 10 feet of distance between the basin and the outlet. That’s roughly a 1-foot drop for every 100 feet of length or a 1% slope. If using a corrugated pipe, it is recommended that the outlet be 2 1/4 inches lower than the basin for every 10 feet. Starting at the spot designated for the outlet, dig a 12- to 18-inch deep by 8-inch wide trench to the spot designated for the basin. The trench should have a consistent slope from beginning to end. Be careful to keep the trench bottom flat so you don’t have high spots in the corrugated pipe that may hamper the flow of water. Drill a 1/4-inch hole in each corner of the bottom of the catch basin. Before installing the basin, place 6 inches of gravel under the basin to eliminate standing water. Dig a hole for and install the basin and basin grate. The basin grate should be flush with or slightly below the surrounding grade. Connect the corrugated pipe to the basin outlet and place the pipe in the trench. Test the drain by running water into the basin with a hose. If the system doesn’t drain, adjust the trench. Many pipe connections in landscape drainage, including those to catch basins, are not designed to be watertight. When testing the system, it will leak. Once you backfill the trench and area around the basin, the soil will seal the connections. Secure hardware cloth to the outlet end of the pipe to keep small creatures from nesting in and clogging your drainage system. Place gravel or pour a small concrete pad immediately adjacent to the outlet to disperse the water and inhibit erosion.